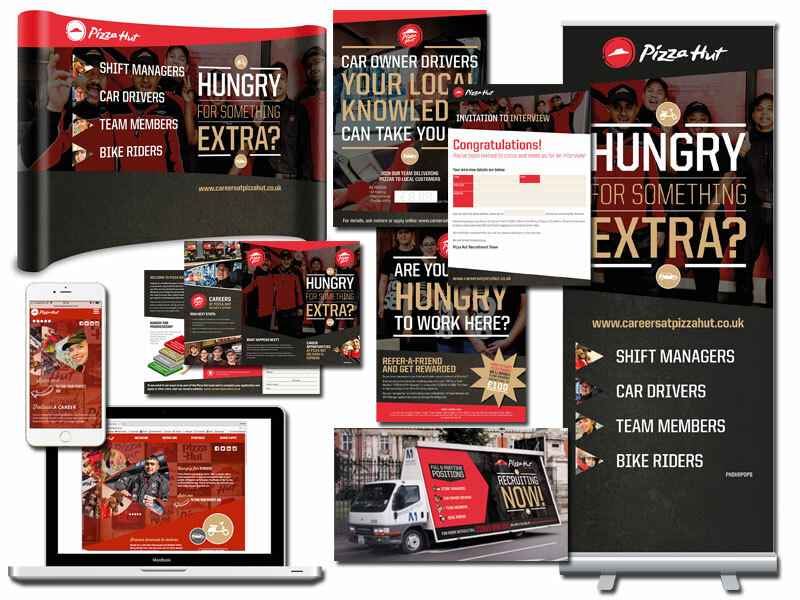 We designed and developed a bespoke WordPress site www.careersatpizzahut.co.uk with a concept based upon pizza slice shapes to create a navigational spinning pizza wheel and an angular web page design to separate content. Finding a suitable solution for both elements was a challenge, but it really sets the website apart and gives it a unique look. The site is designed from mobile up and includes a vibrant Life Unboxed animation about their values that sits on their Culture page, as well as a more traditional talking heads recruitment video for Drivers and another that focuses on their excellent training. However, the real beauty of the site lies in the job search functionally which integrates with a mapping system. Through mobile GPS the system identifies a user’s location and displays jobs within a selected radius. On desktop devices users are prompted to insert their postcode. The map data comes from a third party source and the information is integrated into the map. In addition, we are in the process of applying the employer branding style and to all their internal recruitment materials; those sent to candidates and used throughout the application, assessment and induction processes, with the intention that all the material can be accessed via a password protected portal that we are currently in the process of developing. The careers site went live in August and the advertising materials from September that year. It’s very early days, but first impressions have been very positive, both anecdotally and from initial traffic stats. For instance, the apprenticeship scheme generated over 300 applications in September, and overall, 2,401 offers were made from over 42,000 applications that have come through the site – up 9% from the same period last year.